Inwardly the ride has had it's ups & downs. As usual,I never intended to go so long inbetween posts. Here's what was going on in a nutshell. The stress and nonsense at my part time job finally got to be too much-more demands,no pay raise in 6 years,and being chewed out for something that could have happened but didn't due to my leaving it in a capable co workers hands as my shift was over was the final straw. I fumed for a few days and emailed my "I quit!" letter in mid July of 2012. And no regrets on that tho the financial situation has been shaky. My online music store had done poorly since moving it to Bonanza. I figured it was because of lack of advertising and boy was I right. Not by me tho.....but by Bonanza themselves. I was paying $24.95 a month to be promoted on Google and I was.....but only in the state of California. My main customers are in the south and midwest. Luckily for me,I found this out thru a free Lexity app Bonanza offered. I questioned Bonanza on the California only deal & they never denied it. I found this out early this year. Back to 2012. In late October,I tripped over something while carrying an autoharp in it's case and cut my knee open deeply enough it required stitches. (And I'm dealing with Urgentcare still on getting the overpayment they made me do back) A day after that,my beloved cat Sassy became extremely ill,and I had to have her put to sleep on the same day I had to go have my stitches out. Right after I left the vets office,off I went to the Dr. The next two months I was helping both Sassys sister Lightning and myself thru the loss. Lightning was grieving so badly I had to put her on anti depressants for 3 weeks so I could sleep. The holiday season I did my best to celebrate with a happy heart and that took a lot of effort. Christmas was especially difficult as the mass shooting of Newtown just weighed my heart down. I looked forward to New Years as I felt it was time for a clean slate new start. Enter the New Year with my usual watching of the Rose parade. I learned I could refurbish a clarinet. Even learn to play one! I always loved 20's music and like the sound of the instrument. After researching new places to move my store online,I decided on Yahoo! stores. I am currently adding inventory about an hour a day so I don't strain my eyes. I received an early B-day gift too-I spied an Aria Banjo I fell in love with and was given by my Dad. I discovered clawgrass style and once I have a good grip on clawhammer I plan on pursuing clawgrass. Rediscovery too. I got out my much neglected lap dulcimer and have been playing that. I think I have a knack for it. I've broken out of my shell and am doing music videos on utube currently tho I need to find a better spot to sit & play in. 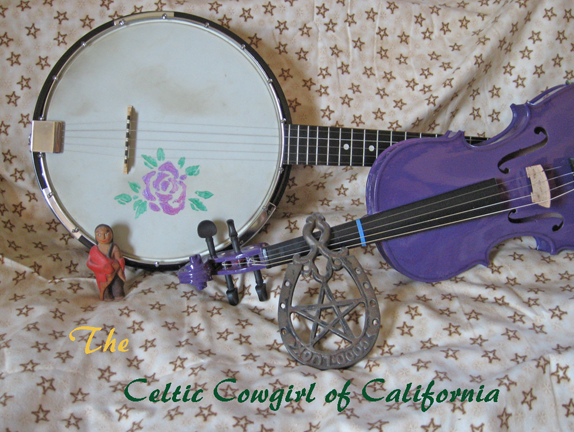 From the looks of things,my main instruments will be dulcimer,mandolin,banjo & fiddle. Tho I also dicovered I can play and refurbish autoharps-I refurbed and sold one this year. I just won a chromaharp in need of parts & repair. I'm trying to get the parts now. I think it will work better for me than the Oscar Schmidt I have now cause it's smaller & I have small hands. I did refurbish a 1964 Oscar Schmidt Appalachian 15 chord autoharp for myself. Now it just needs new strings. Reading wise I'm in the middle of "Delivering Happiness!" to see how I can improve my store and also reading Louise Hay and Dr Wayne Dyer. I have also discovered Paramhansa Yogananda and am reading his work "How To Be Happy All The Time" which I'm finding most helpful. I also have his book "Autobiography of a Yogi" tho I haven't started that yet. It all helps me be the cowgirl that I am! Next entry will have photos and "in the moment" posts,I promise! Up To The Present Moment-Forward Ho!